Whether you're aiming for that Employee of the Month plaque in an intra-organizational VIP Challenge or developing crucial teamwork skills in VIP Work, you'll earn twice the cash and RP right up through Thursday, February 11th in all VIP Freemode activities. This includes protecting your VIP’s Yacht (or attacking a rival's) in Piracy Prevention, assassinating a VIP-in-hiding in Executive Search or stealing the highest value vehicles you can in Auto Buyout. The quickest way to double your money this weekend is via the 12-player Double GTA$ & RP Adversary Modes Playlist accessible directly from the GTAV launch screen. A single button press will put you into a Playlist with other like-minded corporate raiders, ready to play two of the most recent Adversary Mode additions to GTA Online: Extraction & Drop Zone. 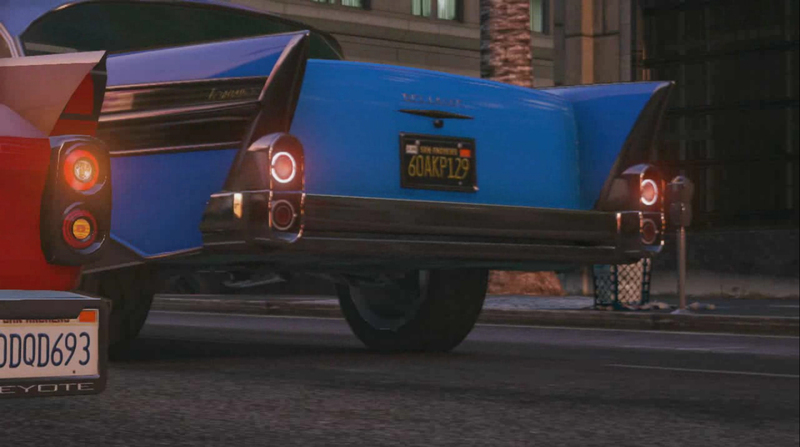 And if you want to replay the Double GTA$ & RP Playlist, there's no need to reboot your kit! Simply find the Drop Zone & Extraction Playlist in the Rockstar Created Playlists section of the GTA Online pause menus. 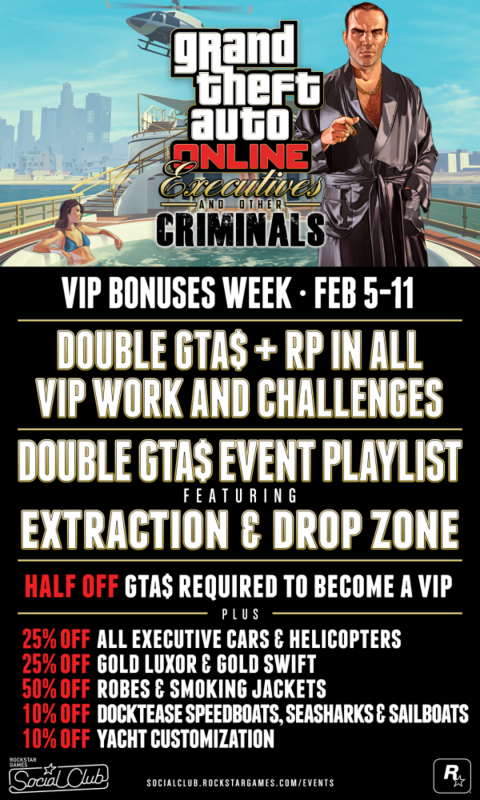 If you're keen to finally earn access to the Executive washroom or get that startup you've been talking about off the ground, for this week only the amount of GTA$ required to become a VIP drops to just GTA$500,000. Remember: there's no startup cost to set up your Organization, this is simply the amount of money you must have in your bank account to prove your VIP credentials. In addition to all of the above, Rockstar is throwing a few extra discounts the way of all Los Santos citizens to help them climb the ladder to the upper echelon of culture and sophistication. Look out for half price discounts on Robes & Smoking Jackets, a 10% discount on speedboats, sailboats and Seasharks from Docktease and a 10% discount on personalization options for Yachts. And for those who prefer more traditional collision sports over executive team-building activities, there's a Double GTA$ & RP bonus for competing in the Running Back Adversary Mode this weekend. GTA Online Executives Bonus Week - Get discounts and bonuses this weekend in new-gen GTA Online.